Hamburg airport was evacuated and closed after at least 68 people reported suffering breathing problems after inhaling an “unknown substance.” Pepper spray could have caused the evacuation, according to firefighters spokesman. Medics treated 68 passengers for toxin inhalation at the airport, of which nine were transferred to a hospital, DPA reported, citing the fire brigade. It all started with people complaining of breathing difficulties after being exposed to unidentified unpleasant odors at the airport in Hamburg on Sunday morning, Hamburger Morgenpost reported. Terminal 1 and 2 were then evacuated and hundreds of passengers had to wait outside at almost below zero temperatures. A pepper spray or a similar substance is most likely behind the incident, a spokesman for the firefighters said, noting that a refill cartridge had been found which could have caused the health problems, DPA reported. The substance was then presumably spread through the building by the air-conditioning system. The possibility of a terrorist attack has been ruled out, the spokesman added. "I want to explicitly deny ... that this was a terrorist attack. As far as we know, it was at no [point] considered a terrorist attack," Hamburg Fire Brigade spokesman Torsten Wessely was cited by Reuters as saying. An airport official said earlier that a gas leak could be behind the breathing problems, irritated eyes, and nausea, DPA reported. A source told Bild earlier that the unknown substance might have gotten into the airport’s air-conditioning system. The environmental services of the fire brigade are currently trying to establish exactly what the substance was. The firebrigade that responded to the call set up first aid posts for those who had inhaled the substance. Flights were canceled for more than an hour because of the emergency, Hamburg airport said on Twitter. The roads leading to the airport were temporarily closed, as well as the S-Bahn railways, according to DPA. 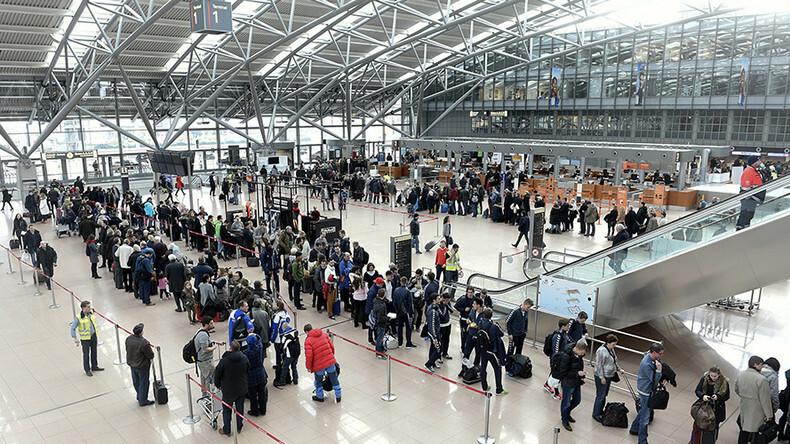 Hamburg airport “has come back to normal,” RT’s Ilya Petrenko reported from outside one of the terminals. A spokesman for the airport later confirmed that it resumed normal operations as of 1245 GMT.